The err_blocked_by_xss_auditor in Chrome is actually a kind of error which appears on screen when a line of missing code or symbol is detected while loading as webpage. In such instances, the Google Chrome, throws aforesaid error. When you see it first, it seems normal as just reloading the website again can fix it. However if the error continues every time, you would need to find a perfect fix to resolve the issue. Technically, all above error messages indicates some code missing in webpage being tried to open, however the possible reason may vary. Even this error can appear on Mac based computers too if the user is utilizing Chrome browser and finds the missing code. So, let’s learn about how to fix err_blocked_by_xss_auditor issue. It would always be unfortunate for users to face the error, but its resolution is available. We are here going to discuss 2 solutions here in two different cases, if you are an administrator, or just an end user browsing the web. In case you are an administering and come to face err_blocked_by_xss_auditor in Chrome, then you can try to fix the error by adding a one-line code in header section of webpage’s source code. If you are a user and browsing the webpage that throws err_blocked_by_xss_auditor in Chrome error, then you should contact the website owner and report them about the issue. Also, you can temporarily switch to other web browser or just disable XSS Auditor in Chrome browser. To do so, follow the guidelines here mentioned. 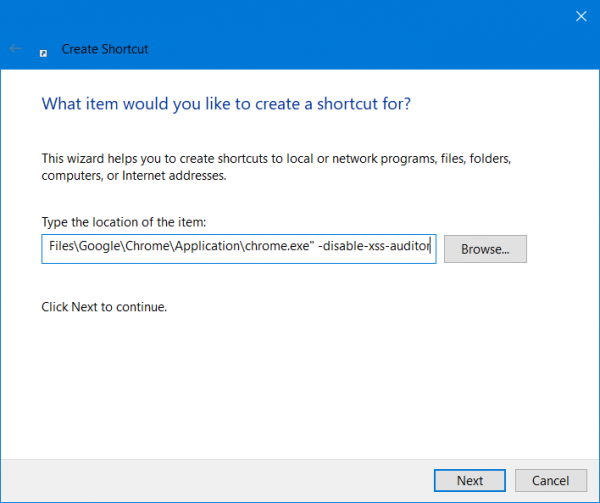 this will actually create a shortcut of Google Chrome to your selected area. This might be a temporary workaround to fix err_blocked_by_xss_auditor in Chrome, but it can be very helpful sometimes.